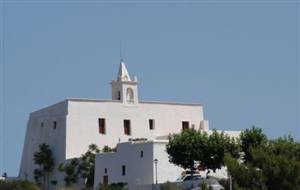 San Miguel is located towards the north of Ibiza in between Sta Gertrudis and Port De San Miguel. It is a small village that almost flows down from the church at the top of the hill. The church was built in the 14th century although the porch and patio were added later. Inside the church there are some fine examples of 17th century wall paintings which have been fully restored. San Miguel is also quite an ‘arty’ village, ranging from the restored painting in the church to the oriental artwork of Dario Bomé and the Can Cameta art café.